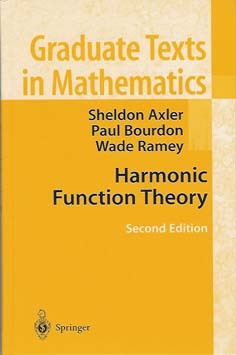 The second edition of this book about harmonic functions in Euclidean space was published in 2001 by Springer in its Graduate Texts in Mathematics series. Readers with a background in real and complex analysis at the beginning graduate level will feel comfortable with the material presented here. The authors took unusual care to motivate concepts and simplify proofs. The pdf file has extensive internal hyperlinks, so that whenever a theorem or lemma or equation or exercise is mentioned, a click on it will cause a jump to the page containing the corresponding item. The pdf file contains an interactive table of contents as a sidebar, allowing for quick navigation. The pdf file can be searched by your computer for any word or phrase, with much greater speed and completeness than possible with a printed index. Printing has been disabled from within this pdf file, so although you can view the entire book, you will not be able to print it. The printed version of the book has the traditional advantages of paper over a computer screen. The ISBN for this book is 978-0-387-95218-5. Order the book from Springer. For readers who wish to explore harmonic function theory on a computer, the authors have developed a Mathematica package to manipulate many of the expressions that arise in harmonic function theory. Our software, which uses many results from this book, can perform symbolic calculations that would take a prohibitive amount of time if done without a computer. For example, the Poisson integral of any polynomial can be computed exactly. Our Mathematica package and its documentation are available electronically without charge by clicking below. This Mathematica package will work on any computer that runs Mathematica. It can be used with or without the book Harmonic Function Theory, just as the book can be used with or without the software.